Politics & piety • 70% of Mormons favor Republicans; only 22% lean toward Democrats. 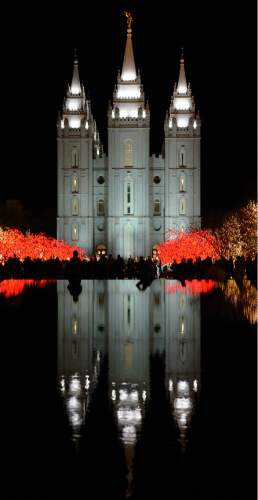 Leah Hogsten | The Salt Lake Tribune Christmas season on Temple Square officially opens each year when the millions of Christmas lights are turned on for the the first time, Friday, November 28, 2014 in Salt Lake City. 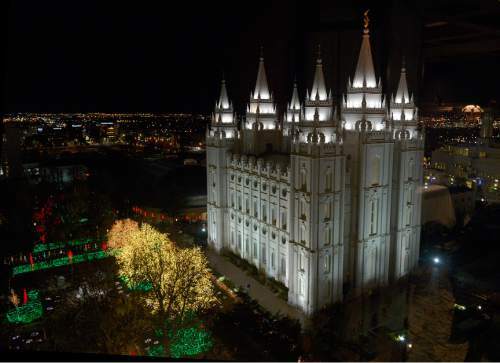 Leah Hogsten | The Salt Lake Tribune Christmas season on Temple Square officially opens each year when the millions of Christmas lights are turned on for the the first time, Friday, November 28, 2014 in Salt Lake City. Mormons lean more heavily toward the Republican Party than any other major demographic group  whether clustered by race, age, gender, educational attainment or religion. So says a study released Tuesday by the Pew Research Center, a nonpartisan think tank. It is based on more than 25,000 survey interviews conducted nationwide in 2014. The survey shows that 70 percent of Mormons lean Republican, compared with just 22 percent who tilt Democratic. That 48 percent gap is greater for the GOP than margins provided by any other single group. Behind Mormons in GOP support are white evangelical Protestants, who give the party a 46 percent edge; white Southerners, a 21 percent GOP advantage; white men with some college education or less, also 21 percent; whites, 9 percent; and the "silent generation," ages 69 to 86, 4 percent. Groups that lean Democratic most heavily are blacks, who give that party a 69 percent edge; Asians, a 42 percent margin; religiously unaffiliated, 36 percent; post-graduate women, 35 percent; Jews, 30 percent; Hispanics, 30 percent; and the millennial generation, ages 18 to 33, 16 percent. "Nearly half of Mormons (49 percent) identify as Republicans, compared with just 12 percent who identify as Democrats; 35 percent describe themselves as independents," the study says. "Fully 70 percent of Mormons identify as Republicans or lean Republican; fewer than a quarter (22 percent) lean Democratic." "Obviously, Mormons are one of the strongest groups for Republicans, right on par with white evangelicals. Both groups are about three times as likely to lean towards the Republican Party," Jocelyn Kiley, associate director of the Pew Research Center, said in a telephone interview. "That&apos;s been the case for a long time." She noted that Pew did a large survey of Mormons in America in 2012 and found then that about three-quarters of Latter-day Saints in the West are Republican, compared to about two-thirds of them in other areas. "Mormons are a strong Republican group, no matter what subgroup of Mormons you look at." No other religious group identifies so strongly with one party, although some come close. About two-thirds of evangelical protestants (68 percent) lean Republican while 22 percent tilt Democratic. "The share of white evangelical Protestants who lean with the GOP has never been higher," the study says. Among Jews, 61 percent lean Democratic while 31 percent favor Republicans. Catholics lean Republican by a 50 percent to 41 percent margin, while mainline Protestants tip Republican by 48 percent to 40 percent. Monson co-wrote a 2014 book, "Seeking the Promised Land  Mormons and American Politics," which examines why members of The Church of Jesus Christ of Latter-day Saints are so heavily Republican. "It&apos;s something that&apos;s been building for decades," he said Tuesday. "What the church has chosen to speak out on and emphasize also happens to be largely consistent with what Republican politicians and the Republican Party have been saying." Monson said, "It starts with anti-Communist positions in the &apos;50s, moves through the &apos;60s and a lot of social issues, and abortion in the &apos;80s. ... Then it moved to traditional marriage and gay marriage in the most recent decade." The BYU professor noted issues  such as instructing members to help the poor  in which the faith&apos;s public positions have been "potentially more consistent with the Democratic Party, but that hasn&apos;t been a point of emphasis." "They [Mormons] don&apos;t connect that to politics as much," Monson said, "and there&apos;s room for people to interpret what they say in ways that are consistent with both parties." Monson noted that Latter-day Saints once were so overwhelmingly Democratic that it hindered Utah&apos;s statehood with a heavily GOP Congress. The pendulum now has swung the other direction. That occurred, he said, as "issues that line up with what Mormons are hearing in church [were] coming out of the Republican Party." As an institution, the Utah-based LDS Church remains neutral in partisan politics. "The church&apos;s mission is to preach the gospel of Jesus Christ," it says on its website, "not to elect politicians."